You’ve worked hard to build your brand. Your customers, clients and patients trust you.We take that trust seriously by developing supplements that both meet our rigorous quality standards and your customer’s wellness needs. If we offer it to you, you can proudly and confidently offer it to your customers. All of our products are manufactured in FDA Licensed, cGMP (Current Good Manufacturing Standards) facilities across the U.S.A. Private Label Supplements creates premium grade private label vitamins and private label nutritional supplements and orders them in huge quantities. This leverage allows us to buy at discounts that most of our customers could not achieve on their own. And we pass those discounts along to you. 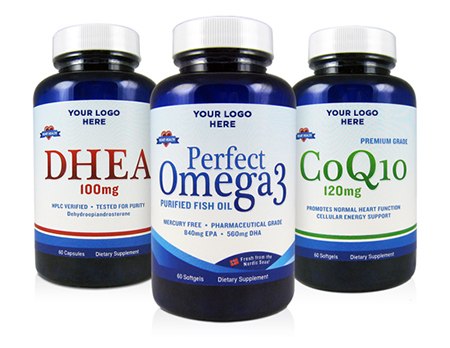 Check out our products and see for yourself how Private Label Supplements can help your bottom line. Don’t let the pricing fool you! We never cut back on quality. Every product we offer for Private Labeling is a premium grade product that you can be proud to offer to your customers. We know that in order for you to become a long-term customer for us, your customer must come back to you time and again for their nutritional supplements. Brand loyalty is the backbone of a healthy business. Contact us to learn more about putting our products to work for you today.